I’ve always loved chocolate though when I was growing up we didn’t know about single origin varieties or different quantities of cacao let alone where the beans are from. We had Hershey’s milk chocolate – in hot chocolate, straight and, in my case, as the icing on a home made yellow cake I would bake with my mother. Now, along with many others, I’m into the intricacies of chocolate so it was with excitement I went to a chocolate tasting offered by Cao chocolates. First off, if you don’t already know there are chocolatiers who specialize in fashioning the confections and then there are the chocolate makers, the “bean to bar” pros. Ricardo Trillos of Cao goes the whole nine yards and then some which is the reason he has, for my taste, some of the best if not the best chocolates in Miami. Cao started online four years ago and now has a retail shop at 9804 SW 77th Avenue, T.3058790281 .Ricardo gets his beans from Venezuela which are reputed to be the gold standard of c hocolate beans. Besides the finest chocolate he also uses only fresh fruit purees, heavy cream, fine liquors and local ingredients from small businesses in the city. 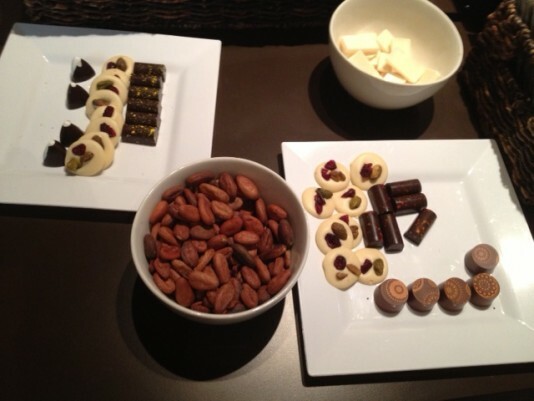 We tasted five varieties including white (34% cacao also made with sugar, cocoa butter, and powered milk – very creamy), milk chocolate (41%), blended dark chocolate (what you commonly get in lesser priced dark chocolates), carenero (73%) and the piece de resistance, Chuao (75%). Chuao is like driving a Bentley, the most famous chocolate makers and chocolatiers use this one.Of course, my preference was this one. All are available in bars at prices ranging from $3 to $5. He also makes chocolate covered or dipped orange and lemon peel, apricots and almonds, 8 different kinds of truffles , and “painted” chocolates with flavors like salted caramel, passion fruit, spicy mango and my absolute favorite, single malt scotch. Besides being divine in flavor, they are aesthetic jewels. They sell for $1.70 each and worth every penny. They also sell mini cheesecakes in flavors like key lime, dulce de leche and of course, chocolate. If you want an insider’s tip, go there in the morning for coffee (Lavazza) and a grilled croissant made by a pastry chef friend, filled with chocolate. Cao chocolates are also sold at Spice Galore (South Miami), the Village Stand (Miami shores),Bottega La Dolce Vita (Coral Gables), Bagel Express ( Aventura) and more places on the way.